Posted on 3/24/2009, 12:55 pm, by batgirl, under Tute Tuesday. 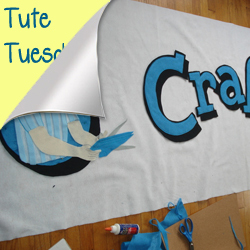 Craftster Community Manager, Jungrrl, created this awesome felt banner to use in the Craftster booth at various craft fairs and events. It made its debut at a very rainy Renegade Craft Fair in Chicago last summer, and it was hit! Most recently it was spotted at the Craftster/Standard Recording party at SXSW in Austin, Texas! Jungrrl shows how it was done in this awesome tutorial. Now you can use her tips and make your next booth stand out from the crowd. Have a favorite tutorial? Drop Batgirl a PM and we’ll consider it for a future Tute Tuesday feature. awesome i didnt even think about doing that. i will have to giv eit a try. « Final Episode of Battlestar Galactica. Frak! No!